Eagle C3—an automated conveyor cutting system for the material cutting industry. 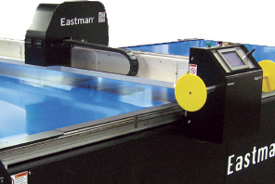 Eastman Machine Company has been manufacturing the most robust automated cutting systems for the materials cutting industry for over 100 years. The Eagle C3 is an automated conveyor cutting system engineered to operate 24 hours / 7 days a week without sacrificing speed or accuracy. It's designed to cut a wide range of materials including vinyl, carpet, canvas, fiberglass, and Kevlar. By using a SynqNet architecture and products, Eastman was able to create a more reliable, flexible, and cost effective machine.